Anyone who lives in Texas knows the risk of spending too much time in the sun. Skin damage is real, and you need to take precautions to keep yourself safe from UV radiation. Along with traditional measures like SPF sunblock and wide-brimmed hats, one of the best ways to keep yourself safe from the sun’s damaging rays is with a vinyl shade structure from Future Outdoors. It’s natural to enjoy spending time outside at your pool, on your patio, or in your backyard. However, the more time you spend exposed to the sun, the more danger you put yourself in with regard to skin damage and cancer risk. Many people have misconceptions about just how much danger they’re in when they spend time outdoors. You might think you’re safe if you already have dark skin or if you only limit your exposure to a few hours, but the truth is skin damage can happen rapidly to anyone. Even on cool or overcast days you run the risk of exposing yourself to dangerous levels of UV radiation. Sun exposure is particularly dangerous for very young children, the elderly, and people with very fair skin. However, you can suffer from skin damage even if you have dark skin or if you’re already very tan. In short, there is a lot of risk to spending long periods in the sun. Fortunately, there are ways to keep yourself safe from dangerous levels of sun exposure. You’re probably already familiar with several: wear a high-SPF sunscreen when you’re planning to spend time outdoors; wear long sleeves and pants in a light, breathable fabric; and avoid intentional tanning either outdoors or in tanning beds. Another great way to protect yourself from the sun is with a vinyl shade structure. When you use a vinyl shade structure, you get a long-lasting and durable cover that protects you from the sun’s harmful rays without blocking you off from the outdoors. 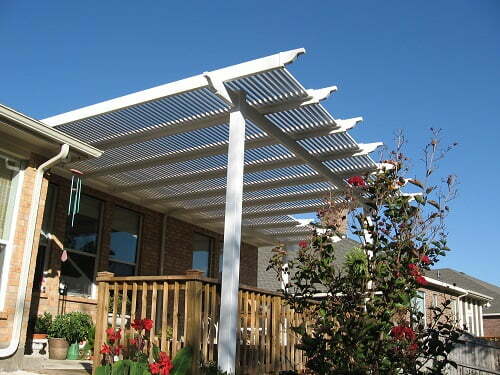 You can even customize your shade structure with louvered or solid walls to add more shade and protection. Keep in mind that a shade structure is not perfect protection from the sun. It’s still possible for UV radiation to reflect off other surfaces or reach you underneath your shelter. However, they do provide a huge benefit over not having any protection. Making it possible to stay outside longer versus not having any sun protection. Resistance to fading and sun damage – Modern vinyl shade structures are manufactured with high levels of UV radiation inhibitors. These inhibitors keep the sun from fading or damaging the vinyl over time, ensuring your shade structure looks great for decades or more. Low maintenance requirements – Vinyl shade structures don’t need any painting, staining, or treatment. They are virtually maintenance free and will keep looking great for many years without any chipping or peeling. Resistant to weather, insects and moisture – Unlike wood, a vinyl shade structure won’t warp, rot, split or buckle over time. It’s also not vulnerable to insect damage and doesn’t need to be treated or sealed. Options to match your home – Our vinyl shade structures are available in several colors to match or complement the exterior of your home. If you’re interested in learning more about our vinyl shade structures and how they can keep you safe and comfortable outside, call Future Outdoors today. We’re the number one installer of vinyl shade structures and other vinyl products in the Dallas metro, and we’re ready to bring our expertise to your project. Call 972-576-1600 today or visit our Facebook page to learn more and see how we can help you.